Coimbatore : The body of student Lokeshwari, who died after falling from the second floor of a private college during a disaster management drill, was handed over to her relatives after post mortem today. Autopsy was performed in the Government Hospital here, where Lokeshwari was brought immediately after the incident. Meanwhile, her parents blamed the college management for failing to monitor properly the drill and held it responsible for the tragedy, Lokeswari’s father Nalla Gounder, a farmer from Nathegounden Pudur, said his daughter was pushed down by the trainer, despite she being reluctant. 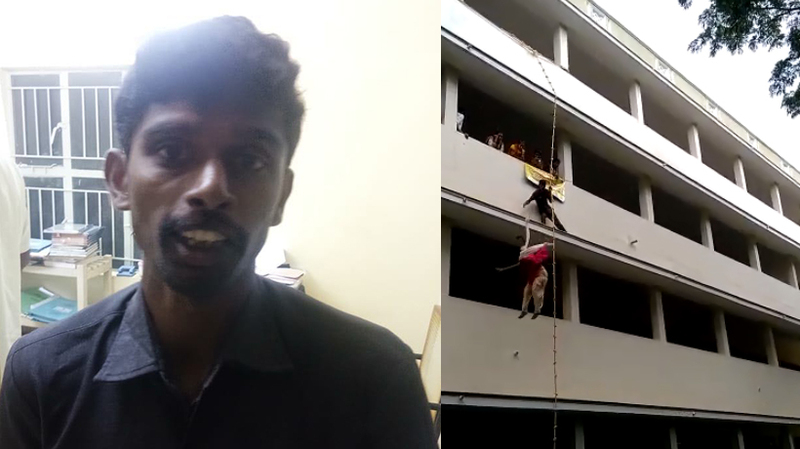 Even trainer, Arumugam was not having proper qualifications, he said.Tears rolling down her eyes, mother Sivakami blamed the college and solely held it responsible for the tragedy. “But we lost our daughter,” she said.